If sleeping is the means that the body repairs itself, for me I feel meditation is the means by which our soul repairs itself. Meditation is popularly visualized as a person sitting cross legged, eyes closed, hands resting on the knee with palms facing up, straight posture and with a benign look on their faces. And maybe when we imagine what goes on inside of the person that’s meditating we sense complete stillness or maybe swirls of the cosmos making journeys through the person’s mind. Here’s the thing that I’m learning about meditation – anything can happen and anything works…as long as you are comfortable and you don’t force it. Meditation to me used to be something that needed to be taught, that needed to be done in a particular way, we needed to visualize a particular light or thing….lots of should’s and needed’s in there. However, more and more I am learning (haven’t reached full realization yet) that meditation has only a few should’s. 1. It should not be forced. Go with the flow. When the thoughts and worries of your daily life come in to crowd your mind and make you frown, just focus on whatever it is that you are visualizing or focusing on ; letting the thoughts just wash over you and pass on. 2. Be comfortable! My knees are currently not as they want to be and I just can’t sit in the cross legged position for long now. So sometimes I sit cross legged and sometimes I just stretch out my legs as its more comfortable for me. 3. Ask for Protection.You should, before meditation ask God and the Archangels (I usually ask Archangel Michael) to clear the space you are in and to surround you with their protection. Meditation to me means opening your heart and mind, so it’s always good to ensure that what may come to you are from light beings. 4. It should be practiced. It’s an art and like any art, it needs to be honed by practicing. The good news is that anyone and everyone can do it. 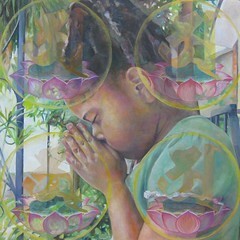 If meditation required talent, then we were all born with this talent. No one was exempted. It is also a choice. It also requires just that small bit of discipline – to practice meditation as often as you can. However, again point 1 applies. Don’t force it either. Balance is the key. That’s about it. I can’t really think of any more “rules” to meditation. The only points that I would like to stress because it is SO important is Point 1 – Don’t force it; and Point 3 – Always, always ask for God (and other Light beings like Archangels, Ascended Masters etc..) for protection. Meditation doesn’t necessarily have to be done with the eyes closed. In can be done with your eyes open for example when you’re driving, cleaning your house, gardening, painting, colouring mandalas and any other activity. It also doesn’t have to be done while sitting, sometimes you can just lay down just before sleeping and meditate; and if you drift off to sleep expect a pleasant and restful one. To me the benefits of mediation are widely known. It helps you to relax, to learn to focus, clears your mind off all the clutter, brings down your blood pressure, heals your heart and soul and even to connect you your Divine self and to God. 1. Find a quiet space for yourself. Quiet helps especially when we are starting out. 2. If you feel inclined to, light a candle or burn some incense to just add to the atmosphere. 3. Sit comfortably, be comfortable. Thrown on your favourite comfy outfit! 5. Take a few deep breaths and let them out slowly. Tell yourself or hold the intention in you that you are going to meditate and that you want to be still and at peace. 6. Now this is the point when I would have to say”To each their own”. When I started meditating 2 years ago and even now, I always have focused on my heart chakra. Our hearts hold the connection to our Divine Self- it is the gateway to our Divine self and to the Divine, our heart is also vulnerable to emotions and hurts; and needs care and attention, our heart to me is the centre of us. If we have blocked our heart and build a wall around them, we don’t let the possibility of love to enter us, we block the potential of us as Light beings, as God’s children. What are power, intelligence, knowledge, talent and success if there is no heart? Heart is where compassion lies. It is where empathy lies. It is what makes us a part of God’s creation and a part of God. I knew I needed to work on my heart. I knew it a long time ago because I had felt it close; it shrank and withered like a flower so for me it was very important to work on my heart. How did I work on it? Well, initially I just naturally felt my awareness go straight to where the Heart chakra sits. In my mind’s eye I saw this garden which was in a very sad state. Lots of withered plants everywhere, the place was overgrown with weeds, it was dark and quite depressing. So I imagined myself walking through this garden and as I walked I allowed light to shine, a soft green light and as the light shone the garden came alive. The darkness slowly got dispelled, the trees grew green leaves again, and the weeds disappeared. Each time I meditated I cleaned a little more until it was a beautiful garden. Now however when I meditate, I still naturally go back to my heart chakra (I’ve got LOTS of work to do there still). This time around I imagine that I’m in this really spacious room, with high ceiling and one wall completely made up of open windows – much like those seen in castles. There’s a comfortable couch on one side of the room and in front of the couch there’s a table with a glowing light that sometimes takes the form of a lotus. The wind is blowing softly through the windows and I hear the waves of the sea washing up to the shore. Sometimes I hear an eagle cry…sometimes not. As I sit, I tell myself these powerful words that Anne Jones shared with me during a private session I had with her. “I want to receive love and I want to give love”. At times I add to that by first saying “I want to open my heart to love and light”. Then, as the wind softly blows into the room, I imagine a soft beautiful calming lovely pink light entering this room that is my heart. When I really concentrate, the feeling is really quite awesome! I can actually feel my heart feeling quite thrilled! Depending on the session, sometimes I just sit and focus on the pink light of love with the sound of the waves below and the eagle cry. Sometimes I have just sat with nothing in my mind…just quiet. When thoughts try to disrupt I try to let them pass on and bring my attention back to the pink light. Sometimes I look around the room and try to decorate it! LOL. – Like I said, most times anything goes. You can visualize a soft white light in a beautiful garden, just a beautiful lake with glorious and magnificent mountains rising up in the distance as you sit and admire the landscape and the silence, you can visualise yourself sitting in a Lotus with some horsepower travelling smoothly along a highway with beautiful scenery…like I said, it really shouldn’t matter. 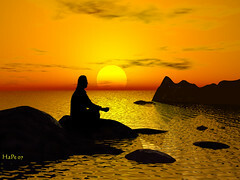 That while meditating you bring your awareness to a place that encourages you to still your mind. That is what meditation ultimately allows us to do. To centre ourselves and to be still. 7. Once you’re done, slowly bring back your awareness to the present and open your eyes. If you were meditating while lying down and find yourself drifting off to sleep, that’s fine too. I just read in a book that it’s just that your body requires that rest. The more you practice the meditation and the more rest you get; and the more you adapt your lifestyle the longer you can meditate even while lying down. Next ›What do the cards have to say ? Thanks Jeya, that’s a very useful and educative piece of information, and precise too. It’s interesting to know meditation can be practiced even while driving, I always had considered meditation implies relaxing and letting your guard down, while driving requires us to be in fight-or-flight mode. I can never imagine putting myself in auto pilot mode driving around in crazy city traffic. Most people like me spend a good part of our mental life regretting the past and anticipating the future with anxiety. I think meditation is a powerful passive tool which definitely can help restore a healthy state of mind,focusing on exactly what’s happening now in our lives instead of ruminating the past. The “chakras” you mentioned are they same as in “Sahaja Yoga”? The chakras are the 7 energy centers in us all. I think they have been known to man for a long time. If you click on the picture of the chakras it will take you to a blog site that talks about it! did not sit very well with me personally after some time. I could surely end up being fascinated. and sometimes, I feel like reaching out/in and slapping myself for doing so! It’s just 1 minute past midnight, the day after Diwali. Just getting home from a dinner party at a friend’s place.